The classic Conversation Cafe — a small group gathered weekly at the neighborhood coffee shop or in a host’s living room — is just one way to use this powerful dialogue method. The CC process is a useful tool to get just about any group of people in any community or organization to go deep quickly. We frequently hear reports from hosts who use it in schools, conferences, churches, and workplaces. But I, personally, had never had such an opportunity until recently. In April, I had the chance to test the Conversation Cafe method in a new and unusual setting. I was invited to give the opening keynote at the Oregon Design Conference , the biennial gathering of the Oregon chapter of the American Institute of Architects. The conference theme was “Think Out/Out Think.” Not an architect myself, I thought long and hard about what I could possibly say that would be of interest to this crowd. Since I’m a journalist, I’m a bit of a professional dilletante. My knowledge of most subjects is a mile wide and an inch deep (well, maybe a few inches). I can tell stories, but how could I speak with authority on anything useful to these highly-trained professionals? Then the solution hit me: Let them do the talking. I suggested to the conference organizers that rather than the usual 45-minute lecture followed by Q&A, we open the conference with a Conversation Cafe. I would speak for 15 minutes about the role of dialogue in social change and introduce the CC process and agreements, then lead the audience through an abbreviated CC process, followed by report-backs from several of the small groups. Borrowing a page from the Conversation Week 2008 playbook, we tapped the conference-goers themselves to generate the questions they would discuss. Several days before the conference, the organizers sent an email to all 200 registered attendees inviting them to suggest questions for discussion. We asked, “What’s the most important question facing the world of architecture and design today?” And pointed them to an online survey where they could submit up to three questions. We ended up with a rich list of some 51 deep, searching questions on topics ranging from social isolation in the digital age to aesthetics in design to equal access to green building (“Why do only the rich get green?”). Click here to see all 51 questions. The night before my talk, one of the organizers, Portland architect David Wark, and I sat up late at the hotel bar and whittled that list down to just five good questions for dialogue (no embedded assumptions, etc.). By tapping the wisdom of the crowd to generate the discussion questions, we figured they would be far more enthusiastic and invested in the dialogue than if I tried to divine the most important questions facing the architectural profession myself. And were they ever. After a brief introduction from conference chair Bob Hastings, I kicked things off with a short presentation titled “The Century of Dialogue — or Building a Culture of Conversation” I invoked the Dalai Lama, who told a crowded stadium on a recent visit to Seattle, “The 20th Century was a century of bloodshed. This century must be a century of dialogue.” I talked about how the media divide and polarize us, how we don’t do dialogue much in the the US because we don’t know how (unlike Europe, where people are generally taught that it’s okay to talk about your disagreements in polite company), and how the built environment is hostile to dialogue. And I shared this observation about the architectural profession: Most professional services exist to save us from threats. Doctors protect our health. Accountants save us from the tax man. Lawyers keep us out of jail. Architects, however, are something else entirely. They exist to help clients realize their hopes and dreams. And as professionals who often play a coordinating role between so many different stakeholders on any project — owners, banks, neighbors, government agencies, and a myriad of contractors — architects are uniquely positioned to act as facilitators (as opposed to engineers), cultivating an ethos of dialogue and facilitation in their work. Just imagine if group facilitation training was a required course in architecture school! Then I introduced them to the Conversation Cafe process and agreements, talking briefly about the importance of each ingredient to cooking up a successful dialogue–the right setting, a good question, a talking object, and a set of agreed-upon ground rules. 1. How can we support physical communities in the age of digital isolation? 2. How can we rebuild our cities to support a sustainable lifestyle? 3. How is our cultural history preserved in our newest developments? 4. How can we seriously address social equity in our design strategies – or why do just the rich get green? 5. What can our profession do the reclaim the title of “Master Builder”? 6. Make up your own question. Everyone then turned their chairs to form small groups of 4 or 5, picked a talking object and a question, and dove into the dialogue. Because of the limited time, about 35 minutes, we shortened the CC process to: one opening round with the talking object (10 minutes); open conversation (15 min); closing round with object (10 min). Not surprisingly, people were so energized, and went so deep so quickly, that we had to practically force some of the groups to stop talking so we could move on to the report-backs. Later, some people even said they felt cheated for time. When the dialogue phase was done, we passed the mic around the room for ten minutes, giving people from six or seven of the small groups a minute each to share with the larger group one insight, observation, or learning they would take away from this experience. I asked for people to speak from groups that had discussed each of the six questions. Finally, we asked everyone in the room to write down one thing they would take away from the Conversation Cafe on index cards we had passed out before the dialogue session began. The conference staff then entered those insights into a spreadsheet, categorized by which of the six questions their group had discussed. You can read those insights here. 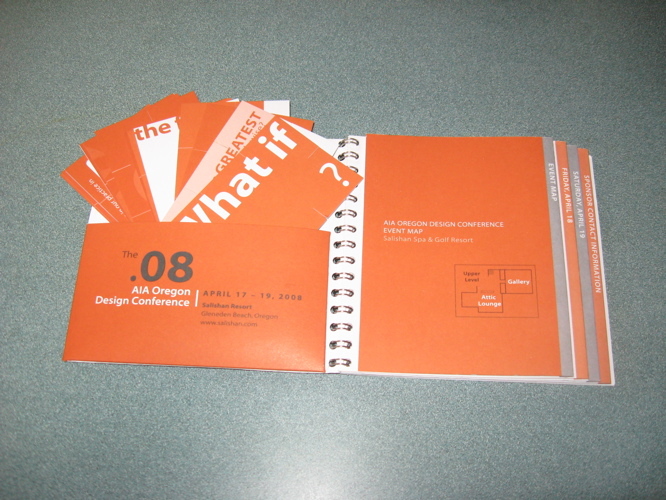 The opening Conversation Cafe session I led was not the only dialogic activity at the Oregon Design Conference. 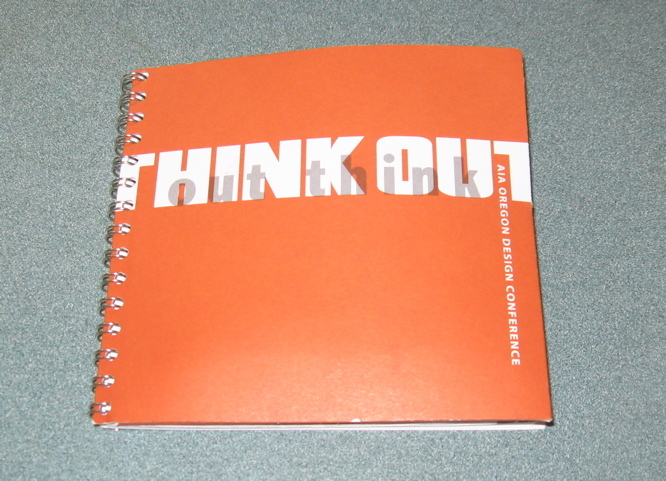 Thanks to conference chair Bob Hastings, there were several other elements in the program that were cleverly designed to mix things up and get people talking to each other. • The tables in the ballroom that served as the main dining hall were arranged in a labyrinthine pattern that required you to wend your way through many tight twists and turns just to get to a seat, literally rubbing elbows with many strangers. • Each day at 4:30 PM, when the afternoon breakout sessions were complete, people gathered in the dining room for a beer and wine social hour. The first day, I helped the conference organizers turn that hour into a “speed-dating” dialogue session, where people were invited to find a stranger and take two minutes each to share something they had learned at the conference that day. – How many more years will humans walk the Earth? – What is the NEXT BIG thing? Each card had notches cut in the sides so people could fit them together and build structures out of them. 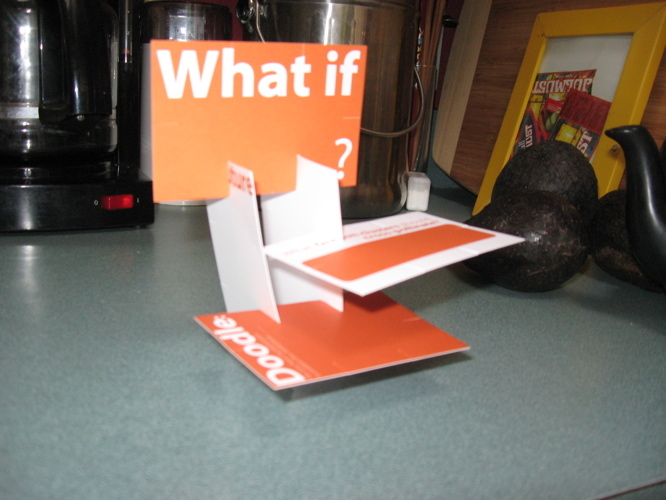 Over the two days of the conference, a number of these three-dimensional card buildings appeared on table tops throughout the hotel (mostly in the bar). Here are some photos of the program and cards described above. I came away from the Oregon Design Conference more convinced than ever that the Conversation Cafe is a powerful tool that can be used not only in neighborhood cafes and living rooms, but in a wide variety of organizational and institutional settings as well. It’s worth experimenting with variations on the CC process, like the abbreviated form we used here. But if I had it to do over again, I would have pushed for an even shorter opening presentation — ten minutes, tops — to allow at least 45 minutes for the dialogue process, including a second round with the talking object. Still, I was amazed at how universally, and enthusiastically, people were able to dive deep into the dialogue. Many, many people came up to me afterwards to say thanks and remark at how they never get the chance to interact like that with their friends or colleagues. Some even said they would bring the CC process back to their schools and firms. I was pleased, too, at how well the process worked without having trained hosts in each small group. Keeping the groups to just 4 or 5 was key, I think, as well as keeping the process and questions projected on large screens above the stage for easy reference. Several of the conference staff had also read the CC host manual and watched the training video beforehand as well. So I had several good helpers prepared to float around the room and keep close watch on the process. Overall, this experiment was a big success. I look forward to bringing the Conversation Cafe to many other conferences. Okay, to be a green professional we need to appreciate the role we can play….